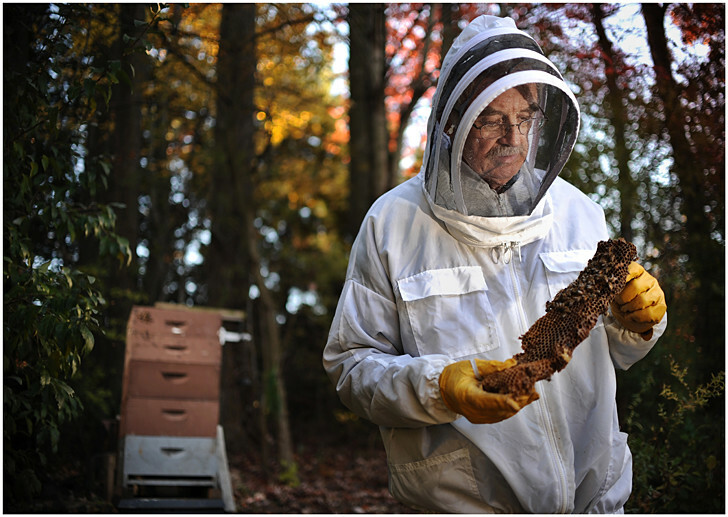 Columbia resident and beekeeper "Jim," who asked that his last name not be used, examines a cluster of bees from his backyard hive, seen at left. 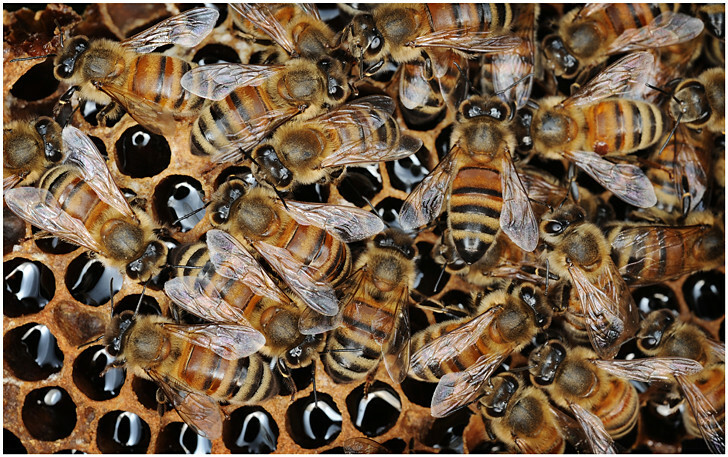 To vague threats such as Colony Collapse Disorder (CCD), and more specific ones like varroa mites, the bees can now add the Howard County government -- if they do not choose to reclassify bees into a category other than general livestock. As of two years ago, to legally keep bees in Howard County you need to live on 3.5 acres of land and observe the same setback requirements as those required for barns. Now, as much as I enjoy saddling up a bee for a day of riding out on the south forty, bees are slightly different than horses. And for people who eat plants (or, who eat anything that eats plants) bees are a critically important link in the food chain. Fresh honey is nice, but we can live without it. Pollination however, is another story. And farmers who rely on bees to pollinate their crops are seeing significant pressure on the bee population. In the winter of 2006/2007 alone, more than a quarter of the nation's 2.4 million bee colonies were lost to CCD1. The reasons for the disorder are not completely understood. But there are also other threats, such as the varroa mites that were identified by Janice Asato of the Howard County Beekeepers Association in this closeup photo of some of Jim's bees. In short, bees are critical to our food supply and are getting stung from several different directions at once. If you would like to help, you can attend the Howard County zoning hearing which will determine whether or not to reclassify bees and amend setback provisions. It will be held at 7:30pm on Monday, December 20th in the Banneker Room in the George Howard Building at 3430 Courthouse Drive in Ellicott City. Or, you can visit Don't Squeeze the Bees for more information on helping to preserve the bee population in Howard County.